Beginning on the edge of the Shenandoah National Park in the Blue Ridge Mountains of Virginia the Blue Ridge Parkway travels 469-miles southwestern along the high ridges and over the tall mountain peaks of the Blue Ridge Mountains ending at the southern gateway to the Great Smoky Mountains National Park. The southern and western edge of Haywood County is bordered by this high range Parkway traveling between 50 to 70 miles along the upper heights of the county. These sections of the Parkway crest the border between Western North Carolina's Pisgah and Nantahala National Forest. Here, high above Haywood County the Parkway includes many of the ' best attraction the Parkway 469-miles has to offer. The highest point along the Parkway lies just above the southern end of the Haywood County, you can not only drive this extraordinary scenic drive you can also stop and hike the high country to take in unusual sites and natural wonders true to the great Blue Ridge and Smoky Mountains Province. Several overlooks view down into Haywood County, offering an opportunity to see much of the county in one long view, stretching its ever so broad mountain shoulders across the distant horizon. You can access the Parkway from Maggie Valley along US 19, or take highway 23/74 south from Waynesville. To get the most out of your scenic road trip the Highlander suggest starting out early and begin your journey from the town of Cherokee where the Blue Ridge Parkway officially ends at the southern entrance gateway into the Great Smoky Mountain National Park. You can reach the southernmost entrance to the Parkway by taking US 441 north to where the junction of the National Park and Parkway meet. The Blue Ridge Parkway will be on the right or east side of the road if your vehicle has a compass. This one-day trip along the parkway skirts the ridge tops offering numerous overlooks with spectacular mountain views. The Blue Ridge Highlander suggests you follow the parkway from its entrance at Cherokee and follow along the western and southern edge of Haywood County to the city of Asheville in neighboring Buncombe County, which is on the eastern fringes of Haywood County. Many natural features will capture your attention along the way including 11 of the 25 roadway tunnels located along North Carolina's section of the Blue Ridge Parkway. You'll reach the Blue Ridge Parkway's highest point just above Haywood County at Richland Balsam Overlook 6,053 feet above sea level. Along your journey, you'll witness magnificent mountain views, the clearer the weather the further the view. You'll pass many roadside sites that have well-marked, well-traveled hiking trails such as Devil's Courthouse which takes hikers up to a large bare rock mountain overlook. Grave Yard Fields area offers visitors a beautiful waterfall view located in a high mountain top valley. The waterfall can be hiked to or can be seen from the parking lot overlook at Grave Yard Fields. A trail leads from the overlook to the edge of the cascading falls in the valley, a short distance below. A hike up to Mount Pisgah has been a favorite activity since this section of the Blue Ridge Parkway official opening. Further along the Parkway you'll witness views of Looking Glass Mountain to the south of the Parkway. The view from several southern overlooks of the "glass mountain" are exceptional, especially after a rain when the gigantic bald mountain face glistens in the sunlight, living up to its name, Looking Glass Mountain. Some of the other views from the Blue Ridge Parkways overlooks are of Cold Mountain, the Cradle of Forestry, Mount Pisgah and the historical wagon trail crossing at Wagon Road Gap. The end of this scenic drive along the Blue Ridge Parkway ends in the next county east of Haywood County, Buncombe County. Descending into Buncombe County the Parkway crosses the French Broad River before reaching the southern end of the mountain city of Asheville, a great place to stop a grab a meal before heading back. Asheville is an exceptional mountain city with grand turn of the 20th century architecture. When heading back to Haywood County you can either go back the way you came and enjoy a whole different view of the Blue Ridge Parkway, being that you'll be going west this time instead of east, or you can take the shorter route back to Haywood County via Interstate 40 west, the average traveling time back to Waynesville along I-40 is 45-minutes compared to the 2 1/2 to 3-hour long drive back across the Blue Ridge Parkway. Personally, the Highlander prefers the parkway trip back when time can afford itself. If the weather forecast is predicting a full day of rain, the Parkway will be consumed in cloud cover. In the winter if there is a prediction for snow or ice storm the Parkway will be closed. When you visit Haywood County, you must visit the Blue Ridge Parkway it's an extraordinary opportunity to witness an engineering man-made wonder. The road provides a smoothed, unblemished surface because no commercial vehicles are allowed on its roadway. High mountain roads can be a little intimidating to inexperience high country drivers, but your confidence will grow with each passing mile. Make sure to fill your gas tank you won't find any gas stations along the parkway, though the planners of the Blue Ridge Parkway conveniently planned a few pit-stops in the valley along the parkway 400-plus miles. Also, be sure to take plenty of liquids and a hearty lunch if you plan on any hiking trips along the way. 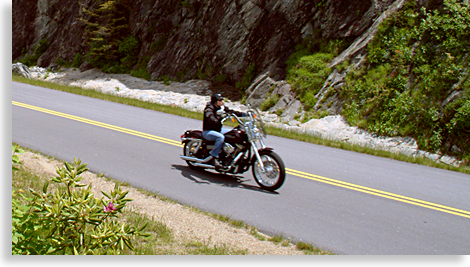 An additional scenic road tour in southern Haywood County also accesses the Blue Ridge Parkway; this scenic tour is the Forest Heritage National Scenic Byway that the Highlander will cover in the next section.